The third WordPress security tip in our series is arguably one of the most important but often the most overlooked – regularly performing updates to WordPress core, themes and plugins. 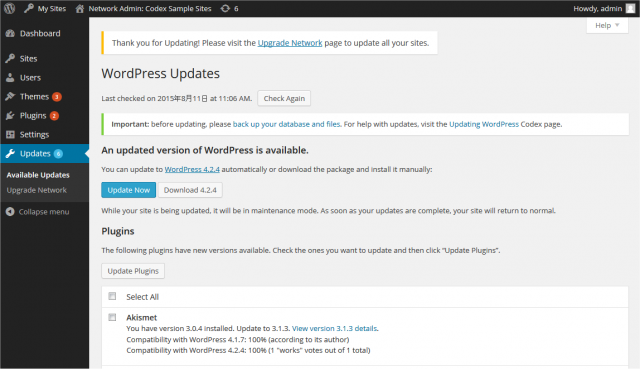 There are a number of different types of updates that are necessary including major WordPress core updates, minor core updates, plugin updates and theme updates. These are released at random but major WordPress updates are said to be released, on average every 152 days according to CodeinWP. Why are regular WordPress updates so important? Updates are almost always a result of a security or maintenance breach within a previous version, often reported by the online WordPress community. Due to the nature of these updates, implementing them regularly is important. Otherwise, hackers will know the security breaches to use in order to gain access to your WordPress site. If you don’t regularly update you are at risk of being hacked due to the breaches found in the WordPress version you are using. The first thing to do is check your site’s dashboard as this is where the core updates will be shown. They are also shown on the left-hand menu under updates. You will also see your theme and plugin update in the left-hand menu. The more complex your WordPress site is the more important but potentially difficult it is to keep up with the updates needed. Before updating we recommend taking a backup. We also recommend that you fully check your site after running backups. This is because sometimes updating a certain part of your WordPress site can interfere with any custom code you have as well as any themes or plugins you’re using. As Managed WordPress hosts we recognise how crucial regular backups are to protecting WordPress sites from hackers. We run a daily theme, plugin and WordPress core updates. These are executed automatically to ensure that our clients’ sites are always up to date. We also regularly update our clients on the most recent WordPress updates and provide a variety of WordPress security tips including how to take regular backups, how to choose a secure username and how to limit login attempts. You can try any of our managed WordPress hosting packages free for 14 days, all information is available on our website.